A Whole Lotta Shakin' Goin' On. this thing is REALLY REALLY fascinating. watched it last night on a big screen. be sure the sou nd is on too. Wow. That Japan one just goes & goes & goes. I love the sound design; we should really do more aural design. (For the tl;dw crowd: 1:40 is a good place to start if you just want the giant Japan quake payoff). Is it just me, or does this not seem like the wisest planet to build our only civilization on? That was pretty neat. I have a the M5+ feed from here in my reader, but even though I've seen most of these quakes in Google Reader, this is what really makes me marvel how quiet it's been here in California, despite our reputation for earthquakery. I'd love to see a similar video over a longer timescale. How long do we we even have good seismic data for? The Pacific Ocean is essentially one big plate, right? Why is the western portion of that plate (Asia) so much more active than the eastern portion (western seaboard of Mexico and the US)? It seems like Chile is the only exception. I mean, I'm not complaining! But it still seems curious to me. Phenomenal youtube. The poster (dutchsinse) has > 1000 videos and > 20 000 000 individual downloads. If I had enough time I would definitely want to poke around in there. The Pacific Ocean is essentially one big plate, right? Why is the western portion of that plate (Asia) so much more active than the eastern portion (western seaboard of Mexico and the US)? It seems like Chile is the only exception. The Geology 101 reason for the activity you see is a function of the types of plate boundaries around the Pacific ring. 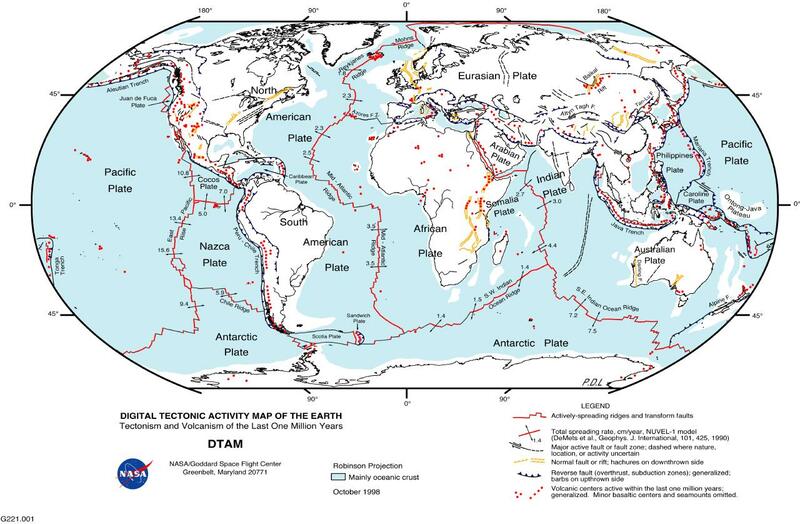 In the western Pacific and South America the boundaries are largely subduction zones, but the boundary in North America is primarily a transform fault. Subduction tends to be a relatively continual process, whereas transform faults tend to move in fits and starts. The Pacific Ocean is essentially one big plate, right? Why is the western portion of that plate (Asia) so much more active than the eastern portion (western seaboard of Mexico and the US)? The other thing I found was this map. It shows which tectonic boundaries are which kind, and how active the spreading ridges are. So the Australian plate may be also adding some energy in addition to the pacific plate's motion. Brazil, the Sahara Desert, Central Russia, and North-Central Canada seem safe. That is disturbing. The people of Japan have had no reprieve with the continual quakes. What a horrific experience; PTSD for all. I'd love to see a similar video over a longer timescale. I agree. My first thought was, 'is this number abnormal?" -- According to usgs.gov (observations going back to 1900) the annual number of earthquakes per year are: one at magnitude 8 and 1319 at 5-5.9. Then they estimated 13,000 at 4-4.9. That would make this a 'light' year for earthquakes?? Very very cool. makes the west coast of the US seem pretty calm compared to, well pretty much anywhere along the western pacific. Someone should do something like this for tornado touchdowns across the US, with wind sounds. Yup, pretty terrifying and humbling. Have linked to Dutch Sinse videos a number of times on MetaFilter. His focus in the past has been more about weather modification using HAARP and fracking, which initially didn't inspire much confidence. But I've done more research about fracking and it's reality based. I'm not sure about the HAARP thing though. However, both my own dad and godfather were involved with weather modification, my dad for profit and my godfather for the Pentagon. So I'll reserve judgment until more is documented scientifically about the effects of the HAARP program. I think Dutch Sinse brought some considerable attention with his videos to the topic of fracking and its gross misuse, as well as the effect fracking has of causing earthquakes. It was quite astonishing to learn there is fracking going on in California, especially because of the potential effects to the environment and public health. When there is any kind of weather or earthquake event, the Dutch Sinse YouTube channel is often a good source of information. He typically includes many links below his videos to government or various science, meteorological and other information resource sites. That video was excellent (although nervous-making for a citizen of California, where transform fault slips are plenty energetic enough, thanks). It made me think of Edward Tufte with its simultaneous display of so many variables (location, intensity, time) in a layout that made the data instantly comprehensible. Leaving a tiny yellow dot for each quake was a brilliant touch - by the end of the video, the tectonic plate boundaries were pretty clearly outlined. I wonder what else the original video-maker has done? There's a disclaimer saying basically that this is not an official documentary, but s/he seems to be a serious geology hobbyist. The USGS (or its Japanese equivalent) should hire this person to do their press releases, stat! I was surprised to read on Wikipedia the theory that the 1906 earthquake may have been caused by human activity as well! (The weight of the sediment deposited in the bay from hydraulic mining shifted the forces around, causing an unusually large number of smaller earthquakes up to and including the big famous one). I don't really know how to evaluate how well accepted or controversial this theory is, and I can only get at the abstract of the cited article, but it's definitely an interesting idea. His focus in the past has been more about weather modification using HAARP and fracking, which initially didn't inspire much confidence. But I've done more research about fracking and it's reality based. I'm not sure about the HAARP thing though. Uh, yeah, the HAARP/weather mod conspiracy theories are pretty much a total disqualification of a source. I looked at the "plume maps" you linked to and those are really sketchy. There's a big scary map of the plume of Xenon 133 all over the US. But that's just a scare tactic since X133 has a half life of ~5 days and is a gas so it's not like Plutonium or Cesium isotopes are being deposited on US soil. Xenon is used for monitoring of nuclear testing because it disperses widely as a gas, and it has a short half life so any spikes are easily detectable and indicate a nuclear event. So the map merely says a nuclear event was detected. I'd like to see a current X133 map, I suspect it would be basically blank. And BTW cloud seeding for weather modification is radically different than HAARP using electromagnetism to modify wether and cause earthquakes. Salting clouds with silver iodide has a measurable physical effect. The effects of HAARP can only be measured within the confines of a tinfoil hat. Uh, yeah, the HAARP/weather mod conspiracy theories are pretty much a total disqualification of a source. Do you mean to say his interest in HAARP disqualifies all Dutch Sinse videos? Isn't that throwing the baby out with the bathwater? Newton was interested in what would these days be considered serious tin foil hattery, in alchemy. Does that disqualify everything else Newton did? No. Einstein believed in God. Does that disqualify E=MC2? No. I think it's a wise skeptic that takes what does make scientific sense and either discards the rest or waits and sees. In the meantime, I'd rather value what Einstein and Newton discovered and has been proved scientifically, and discard their alchemy or God beliefs, rather than discard all their ideas. I'd rather discard the HAARP videos but value Dutch Sinse's excellent collection of science-based videos, like the one above. Bad example with Newton, alchemy was pretty much the state of the art at that time, and was intertwined with the development of scientific chemistry. It's like Kepler, who was an astrologer at a time when there was little distinction between astrology and astronomy. And I'm not sure that the Einstein example is any better, his cosmological interpretation of God is subject to varied interpretations. But yeah, the tinfoil hattery required to accept the conspiracy theory of HAARP (let alone promote the conspiracy) pretty much discredits your ability to interpret reality, let alone science. charlie don't surf, If you would be so kind to be patient with me, I would like to comprehend why you think the way you do. Perhaps this should be sent by memail but since it concerns the credibility of Dutch Sinse videos and the original post of this thread links to the Dutch Sinse YouTube channel, I hope that it is relevant to this thread. Does that mean that the excellent video above, the original post, linked from Dutch Sinse's site should also be discredited? To me that seems like black and white thinking, wanting total perfection all the time. It seems wiser to me to examine what is worthy and discard the rest or put it in the the "I don't think so." file. At the moment the HAARP conspiracy is in my "I don't think so" file. But I still value Dutch Sinse's other videos, most of which have links to other scientist's websites. That plume video you referred to in your comment was not Dutch Sinse's video of his own creation, it was from the Austrian Meteorological site, usually considered a reputable and science based source of information. That is not to say I believe the video's ideas but I think it was worth looking at when the Fukushima catastrophe took place, simply because in an emergency, such as an earthquake, tsunami or nuclear disaster, it seems practical to cull information from many science based sources and sift through the information for usable data. Hiding data from the public happened at the time of Chernobyl as well. People did not trust the government in Japan was being forthcoming about the dangers of the nuclear plume and wanted to examine as much international data as possible. It turned out that suspicion of the Japanese government and Tepco was reality and science based, even if all the information, such as the Austrian Meteorological Site's information was not accurate. The mainstream media does not use the word conspiracy because it is totally associated with tin foil hattery. However, after the earthquake and tsunami hit the Fukushima nuclear plant, the corrupt collaboration between Tepco and the Japanese government to keep information from the Japanese people secret, which resulted in many lives being endangered due to radiation exposure is, in actuality a conspiracy, in dictionary definition terms. Real life conspiracies can and do happen. Example of one, documented/revealed by whistleblower Daniel Ellsberg and the examining of which brought down President Nixon. Just because some conspiracies do happen, I do not think it wise (or sane or reality based) to think all conspiracies happen everywhere all the time or to believe all conspiracies. Examples of other conspiracies outed by WikiLeaks, usually referred to in the more media-palatable terms, as "scandal", "collusion", "corruption" or "an ecosystem of corruption". Then, thinking about taking what is reality/science based and discarding the rest. There have been many scientists in history who have been emotionally or mentally unstable or did not have a science based grasp on reality at one time in their life or another. Many were understood to be nutty/sadistic/weird/paranoid at times but their science/discoveries/research is still valued. Brilliant mathematician and paranoid schizophrenic John Nash is an example among many. Jack Parsons, who founded the Jet Propulsion Lab "saw no contradiction between his scientific and magical pursuits", the Jet Propulsion lab still stands, it wasn't deleted or ridiculed because he prayed to Pan every time a rocket went up. You're conflating insane illogical conspiracy theories with commonplace political intrigues. There's a big difference between delusion and corruption. Hey, I may even believe in a few nutty things myself, but I'm not on a crusade to get people to believe in them, or saying that my ideas are being suppressed by a conspiracy. Look, I'm not going to get into a huge derail here. I have zero tolerance for tinfoil hat conspiracy nuts and HAARP/weather control is a trigger that sets the BS detector to 110%. Just because a conspiracy nut may point to legitimate scientific sources once in a while does not mean they have the ability to interpret them. I can get my reality-based information directly from rational, authoritative sources. This is the first time I'd heard of DutchSinse - so I clicked a few of your links to take a look. I only wound up at his channel though. So I looked at a couple videos. Since there was just a sizeable quake in Mexico he had a bunch to say, but it seemed like he was just making alarmist and unconvincing predictions based on publicly available information. And his analysis was premature - the Mexico quake's magnitude has been since revised downward, and the soCal quakes me mentioned - seem to have been revised away - or at least I can't find them on the USGS maps. The FPP video wasn't created but DutchSinse either - he reposted it, "with hattip and permission request". It's not clear that he actually got permission though. The original is here. Now there's definitely value in finding videos like the one in the FPP, and aggregating some other earthquake data. But a few things really don't sit well with me - the alarmist analysis ("Be aware that further movement WILL OCCUR as a result of this Mexico earthquake.") based on premature data, combined with the request for donations seems kind of icky to me, and so does reposting someone else's video to his own channel. I didn't see any conspiracy theory stuff, though he did briefly mention HAARP and showed some magnetometer data but didn't explain what it was or what it meant, so I ignored that. charlie don't surf, Thanks for your opinion and for participating in the conversation. You said you may "believe in a few nutty things" and that may well be true. But I do not use that to discredit all that you say, which is my point. You said: You're conflating insane illogical conspiracy theories with commonplace political intrigues. There's a big difference between delusion and corruption. No, I don't think I was conflating. I gave examples of actual conspiracies, which can be euphemistically named political intrigues but by the dictionary definition, they are conspiracies. I mention this because that is the term, conspiracy, used to indicate lack of credibility and I think it is more practical to say, "he has some nutty beliefs but some of what he says seems to be valid". HAARP is, to the best of my knowledge, being used as part of a conspiracy theory with no basis in reality and, as such, I totally dismiss it. But there are other Dutch Sinse videos linked in his collection of excellent quality, such as the one in this post. Sorry to be a bit surly there, HAARP conspiracists really yank my chain. But you know, even a stopped clock is right twice a day. You're not, imo, being surly charlie don't surf. I perceive you as being patient with me, which I appreciate. May I ask you why the HAARP conspiracists, in particular, yank your chain, among the many possibilities of having one's chain yanked? I think it's the pseudo-scientific aspects of the HAARP thing that bugs me. Hey, if it was an argument about a conspiracy to cover up aliens crash landing at Area 51, that's just piggybacking on "normal" corrupt government secrecy. But the HAARPies try to piggyback their pseudoscience on real science. The invisible electromagnetic energy coming from radio antennas can be blamed for anything. Yeah, it is disturbing when something reality based is twisted into pseudo-science, I do agree. Looking at the Wikipedia entry, HAARP's description leaves lots of room for the imagination.